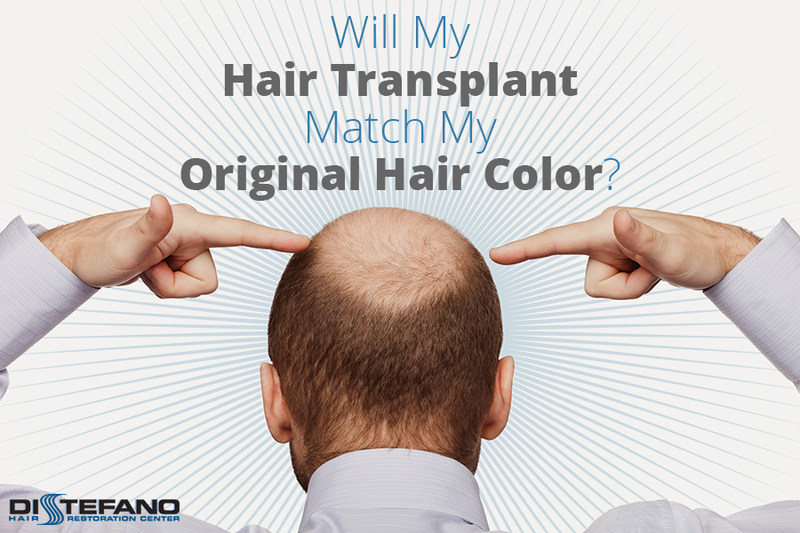 How Well Do Hair Transplants Match Original Hair Color? Hair transplant recipients often wonder if their new transplanted hair will match the hair naturally growing immediately around it. The truth is, it varies from patient to patient. For example, someone who has experienced little to no graying should experience one consistent color, while someone whose donor area had previously turned gray may notice two distinct shades growing together in the transplant area. Luckily, hair transplants can still deliver desirable, natural results. For patients who are already experiencing graying, either in the donor area or the areas receiving a transplant, mismatching is much more likely. The good news is that transplanted hairs are placed in the recipient area of the scalp in a relatively random order. So, even if two different shades are present, they are likely to be distributed evenly and thus less noticeable. Predicting how well the transplanted hair will match is a little tougher for patients who are not yet graying. Everyone’s hair changes over the years, so it’s impossible to predict very early on just how color distribution will look long after a transplant is performed. When Can Transplanted Hair Be Dyed? Hair transplant recipients who want a more uniform distribution of color in transplant areas may wonder when it’s possible to start dying it. Again, the answer depends on the patient. How quickly one heals after surgery is a big factor. It’s critical that all incisions and recipient areas have fully healed before reaching for hair dye. The chemicals used in hair dye could potentially damage the follicles if they have not fully healed. Additionally, patients may want to wait four to six weeks for the transplanted hairs to complete their initial shock period to ensure that the grafts are firmly in place and receiving adequate blood flow. For more information about hair transplants, post-surgery care, and more, contact DiStefano Hair Restoration Center today. We’ve been at the forefront of the hair transplantation industry for more than 15 years and have successfully performed more than 5,000 hair transplant procedures for both men and women.